The first time I participated was 2005 and I ran the (odd) distance of 3.5 miles in 36:24 - but I think that was before they chip timed the event and you self reported your time, so who knows how accurate that is. I know I ran several times between 2005 and 2011 - but for some reason none of my times are showing up on the Corporate Challenge website. When I joined my current company, I became the Corporate Challenge team lead, so I managed getting our tent and food and registering our company. That was in 2007, and I know I ran it that year. I'm pretty sure I ran it the next year too. 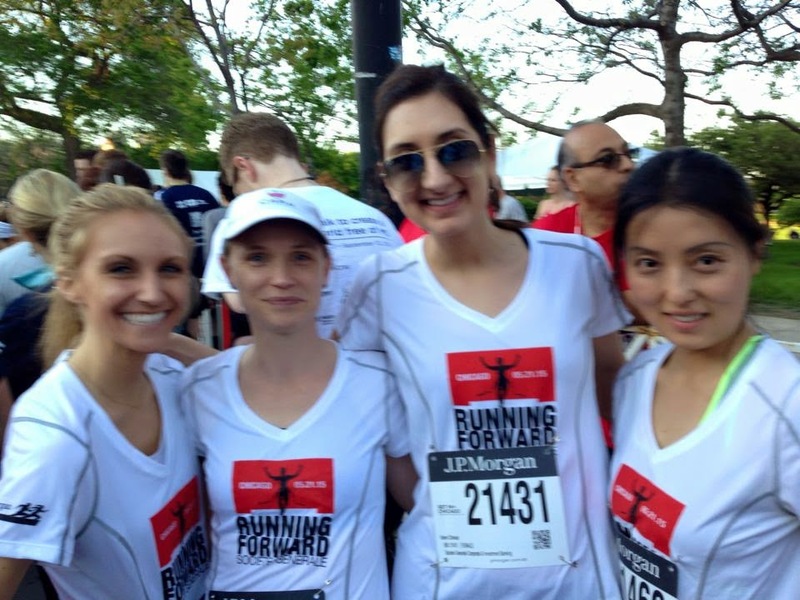 I know I did not run it in 2010 because I had baby H. the Monday before the race. But 2011 I ran with a recorded time of 35:57. I skipped 2012. I ran in 2013 (35:52), but I skipped again last year because honestly I had begun to hate this race. But this year, after a debacle of having no one in our office sign up and then needing to find ways to get people to sign up, I signed up and ran in 35:07 - so at least I am getting faster - but I still hate this race. After having to be the team lead for several years, I'm kinda just through with it. It used to be too hot, but then they moved it to the Thursday before the Memorial Day weekend. But now the weather is so unpredictable it's still too hot, or it's freezing cold or it's raining. It seems like no matter what, there is some sort of extreme weather Memorial Day weekend. About 25,000 people sign up for this race; a good number of them walk it. I have no problem with walkers, and I understand why they want to start at the front just as much as someone who is going to run wants to start closer to the front. They don't want to be stuck behind so many people that it takes 30 minutes to even cross the start line. They'd like to be done walking as quickly as possible to get back to their company tent and enjoy the food. I get that. But that means walkers are going to be interspersed throughout the course. That means if you're running, you're weaving. And walkers are three and four people abreast because it's much easier to carry on a conversation when you're walking and not actively trying to pass people. I seeded myself correctly with my pace, and I spent the entire race weaving in and out of walkers. There was never a time where I wasn't passing someone who was walking except maybe the last half mile. It's frustrating to say the least. And running when you're frustrated isn't fun. Each year I try to go into this "race" with a zen attitude of just treat it like a run not a race. But you know how it's hard to not "race" when you're running a "race". Yeah, that. And so I want to "race" and then I get frustrated because even though I'm actually running a pretty good pace, there is a lot of stopping and starting, it's just not that much fun. So that's why I'm not a big fan of the Corporate Challenge. Do I think there is anything they can do to help? Well for some reason this year they only had two bibs - people running uber fast and the rest of us. So even though technically there were seeded corrals - you could get into any one you wanted. Going back to at least trying to have different pace corrals would help. Other than that, no, there probably isn't anything you can do except maybe let the walkers all start at 6 and then the race could start at 7 and we wouldn't be in each other's way. I wasn't the "team lead" but was partially responsible for getting people to sign up - which no one wanted to because the company was no longer sponsoring the cost of registration. This changed when they had a whopping five people (me included) signed up. The weather was actually good running weather. We were able to listen to decent music courtesy of the Hyatt tent next to ours. In the end we had 50 people sign up for the race. However we had 25 people show up - a little disappointing. 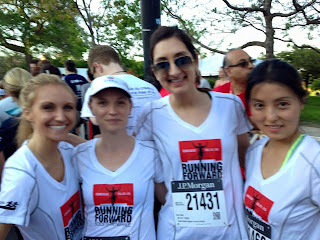 I was the third girl in my company to finish - I tried to keep up with our intern, but just couldn't hold out at the end. Now I don't have to think about it anymore - until next year. BIL, SIL, me and nephew pre-race. So last year, Mr. H. totally rocked this marathon and set an awesome PR in which he missed BQ'ing by 3 seconds. As you already know, he was trying to actually qualify for Boston during the Wisconsin marathon a few weeks ago, so he had no intentions of running the Cleveland Marathon . However, because of a sister-in-law's law school graduation, we had need to be in town, and because a different sister-in-law and her husband had recently taken up running (possibly getting swept up in the running fever watching Mr. H. last year), we signed up for the 10k held in conjunction with the marathon and half marathon. Unfortunately, Mr. H. has not yet fully recovered from his marathon, so he bowed out of the race. He ended up making the smart move, because despite the fact that it is 40 degrees right now and was in the 40/50s the week before the race, race day it was in the mid 70s with 90% humidity. Yeah, we basically ran in soup. 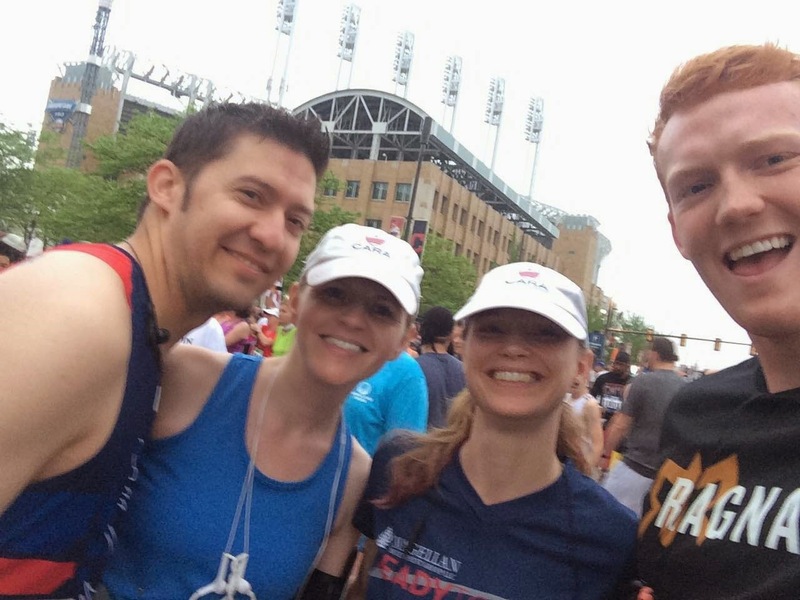 This being Cleveland, even with three races at one time, the number of people running the race wasn't too bad (about 12,000 overall). Of course, it's all relative, because my relatives mentioned how much larger this race was than their last (and only) 5k. Corrals were self seeded, so we got into our mid-pack corral and waited. While standing around, there was a 2-3 minute downpour that I both wanted to continue and wanted to stop. I don't mind running in the race, especially when it's hot. But then again, I had my phone on me and had forgotten to put it in a plastic bag, so I didn't want to risk it getting wet. We started downtown right next to the Q (where the Cavs - boo - play) and then wandered around the west side of Cleveland before heading back downtown. All three races were on the same course until mile threeish. My sister-in-law had a dream about not making the 10k turn and finding herself on the marathon course. I told her it would most likely be clearly marked. And it was. As we ascended a bridge, marathon/half marathon runners were directed toward the left, 10k runners on the right even though the bridge wasn't divided. There was another sign directing us to the correct path at the bottom of the bridge where the split actually happened. After the race she laughed and said the signs couldn't have been plainer. Of course, I've seen courses that aren't well marked, which is never fun. At about mile 4.5 we went back up another hill - an entrance ramp to the Shoreway (kinda their Lake Shore drive, but more a highway than LSD). The last mile and a half mirrored the marathon and half marathon course. We had the marathon flags on our side, so it was kinda fun pretending that I had run 25, 26 miles when I actually actually run 5, 6 miles. With how hot it was, it felt like I'd run more. And I honestly have no idea how the marathon and half marathon runners did it. Last year it was cool at the beginning of the race, I remember having on a coat and gloves to watch Mr. H.
My finishing time was 1:01:47. I finished 30/176 in my age group, 351/1,520 gender, 808/2,478 overall. I'm happy with this time. I know I could have gone faster, but am glad I didn't push it. I really need to do some hill training if I'm going to run in other cities. Seriously, we have no hills in Chicago. It does not matter if the week leading up to a race has been 40 degrees and cloudy. If it is April, May, or maybe even June, on race day it will most likely be above 70 with some ungodly amount of humidity. There is nothing to do about this but get used to it. 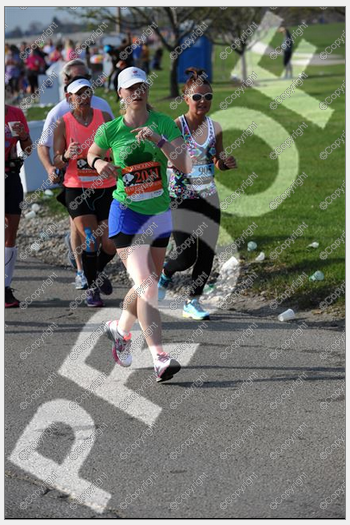 Marathon Photo does not like me. Pictures of the rest of my family. None of me - apparently not even the one that I am actually in with them because while they were tagged in the photo, I am not (yes, my bib is clearly showing). I have a long list of excuses why I didn't meet my expectations for this half marathon. They are, in no particular order: the weather, the hills, over training, under training, exhaustion from a recent work trip to NY, swimming in the pool at the hotel, sitting in the hot tub at the hotel, being in Kenosha, being tripped (accidentally) by Mr. H. as we walked to the start line. I don't know what combination of or if any of these things played a part in how I felt on Saturday. Maybe it was just one of those days. We drove up to Kenosha on Friday afternoon and enjoyed ourselves in the hotel pool. I didn't actually do any strenuous swimming; we mostly just stood around watching Baby H. swim across the pool. Afterwards we enjoyed a pasta dinner at a local restaurant, eating early enough so as not to have any digestive issues. Saturday morning we woke at 5, had a normal pre-race breakfast with the exception of it being in a hotel lobby. We made our way into Kenosha, found a place to park and walked to the start line a few blocks away. It was warmer outside that we were hoping for, being already in the mid 50s when we woke so I went with the lightest option of clothing, shorts and a short sleeve shirt. Pre race was pretty normal. Mr. H. and I just barely got a porta-potty trip in before the start, but we managed it and other than me tripping, it was all good. The race was a couple thousand people total in both the half and full marathons, not too big, but enough people - at least in the half - to not be lonely. Going out, the first couple of miles I had that heavy leg thing where you're getting warmed up, but I was managing to keep the 10 min pace I wanted. I actually had a few extra seconds to spare, and by the time I got around to mile six, I had about 30 extra seconds. But then this is where things started to get interesting. 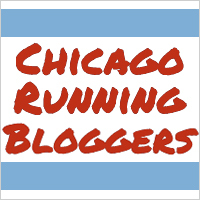 The course wasn't hilly in the true sense of the word, but I would call it hilly in the Chicago sense of the word. And the hills weren't that steep, but there were several rolling type hills. Added to that, the temperature kept going up. Again, I wouldn't actually call it hot, but certainly warmer than what we've been used to running in lately. Around mile eight or nine we're out of these rolling hills and headed back into Kenosha. Though the course was flatter, my pace started slipping and I am eating into my cushion of maintaining an even 10 minute pace overall. As I got to mile 10, I can see the finish line across a small bay, which I considered swimming across just to be done. At this point I'm not trying to really meet my goal of 10 min splits, I just want to stay under my PR. I did have a few minutes of trying to figure out how to make my body believe I hadn't already run 10 miles and I was just out for a quick 5k. But my body's not dumb and the next couple of miles I see my hopes of even PRing disappear. At mile 12, as the course finally turns back to the finish line, I look at my watch and figure out that if I pump out a 10 minute mile I could at least PR by maybe a few seconds. I actually got up to a 9:45ish pace for a while, but it was not to be. Finishing time 2:17:16. Off my PR by a little over a minute. Mr. H. has a similarly disappointing marathon. One in which he had hoped to BQ, but ended up running 9 minutes slower than his PR. Knowing that, and seeing so many people walk in, I do feel a little bit better knowing it was most likely the heat (and hills) that made this not the race for me to PR. It's disappointing, but it's also funny that I'm at a point that I can be disappointed with a 2:17 half. That is by no means anywhere near my slowest half marathon. In fact, it's my second fastest. Would I run this race again? Probably since it's not a bad course overall and I could count as hill training. And since it's Kenosha, we were home by 1 pm. But then again, I suspect I will harbor resentment towards this race and will be happy enough never to go to Kenosha again. Oh well, there are other halfs out there. Plus - the medal has a bottle opener on it and we all know I have enough of those.